Our vision was to showcase the strength, determination and power of the athletes through the creation of an event branding that stayed true to the beauty of the sport yet allowed for us to add a measure of mystery, grit and weight to the visuals. Catching the eye of potential fans and drawing them into the world of fencing through a branding style reminiscent of the great epics and sagas of history, the excitement of the sport of fencing was communicated using near-mythical imagery that elevated the athletes to legendary warriors and incited a sense of curiosity in viewers. It wasn’t our first rodeo, having successfully branded previous years’ Grand Prix Series events for FIE, and our design team was ready to tackle the challenge. In the process of identifying key visuals representative of the sport and its values, the idea of fencers battling atop twin rock plateaus quickly came into focus. This representation of strength and power, the athletes’ feet steady on top of the world, became the center of our event branding. One series, nine cities. One international community of fans. As we developed the branding it was clear that a versatile, multi-platform visual was going to be essential to the promotion of the events, generating a global buzz surrounding the Grand Prix. Host city image compositions (to be used in event-specific communication) were created to showcase the nine locations where the Grand Prix Series took place. A location-neutral composition of the design was employed to publicise the event in its entirety. 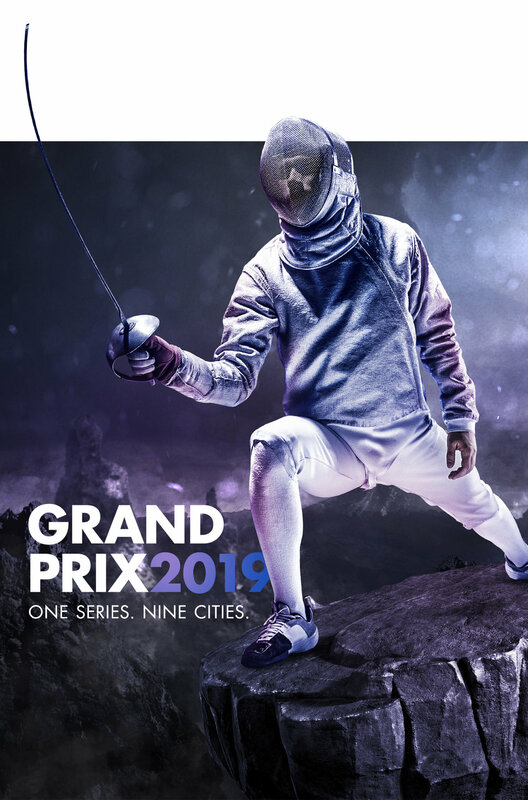 Posts, banners, website content and more were also designed to cater to the three disciplines within fencing through the all-important visual of the sabre, epee and foil. Make your mark absolutely everywhere. Individual banners for YouTube, Facebook, Instagram, Twitter and the website ensured fans across the platforms were able to see the content and engage with the event, bringing the visuals to their attention as much as possible. As a clean, fair sport with a long history, its newfound gritty edge was sure to attract fans from across the countless demographic categories.